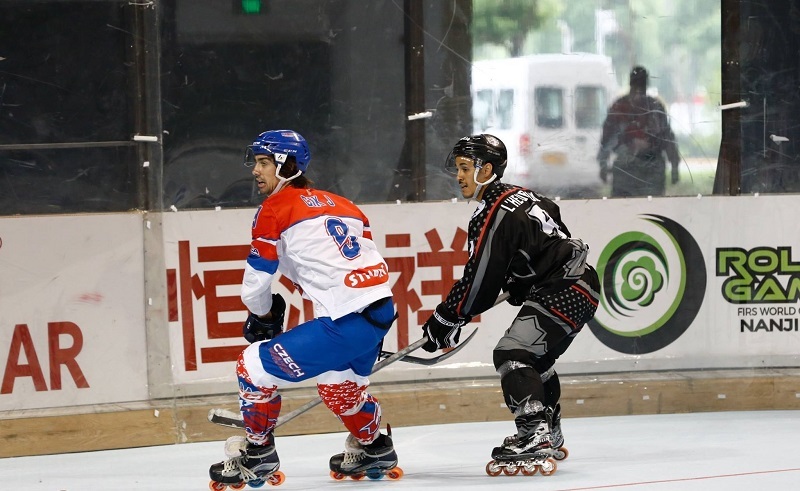 Kévin L’Heureux has played roller hockey all over the world, including in Italy and China. When he plays in Montreal, he goes to Le Rinque in Town of Mont-Royal, the only rink that hosts indoor roller hockey in the city. L’Heureux plays defence for the Montreal Ducks in the highest level of amateur roller hockey in the city. The Ducks play in the Montreal Roller Hockey League with four total, with three seasons each year—one in the summer, fall, and winter. The Ducks compete in tournaments across North America, and some of their players have played for other competitive teams in the United States and France. L’Heureux (third from right) during his time playing in France in 2011. Photo courtesy of Kévin L’Heureux. L’Heureux played in France in 2011, and in the United States with the Hartford Fireants for three years. He took his roller hockey career to a new level, however, with the Canadian national team. L’Heureux played at the 2017 WRG World Skate Championships in China and the 2018 World Inline Hockey Championships in Italy. The defenceman says roller hockey isn’t growing enough in Quebec because of the lack of space and resources. L’Heureux also coaches roller hockey to young kids once a week, but still admits he doesn’t have very many kids attending his practices. Despite the name similarities between ice and roller hockey, L’Heureux said there are many differences between the two sports. Roller games are played on a surface of 164 by 82 feet (versus 200 by 85 in ice hockey), with four skaters on each team, plus a goalie. The goalie also wears roller skates, which makes the position more challenging to play than in ice hockey, or even a ball hockey. Main photo courtesy of Kévin L’Heureux.